Use the form below to inquire about Estate Bungalow at Jalan Nagar . Use the form below to reserve for Estate Bungalow at Jalan Nagar . This is a Non-AC room and is located in the annexure building. It has a single bed and an ensuite bathroom. Experience Assam’s hospitality and its natural opulence during your holiday at the Estate Bungalow at Jalan Nagar. Well-manicured tea gardens that sprawl as far as the eyes can see have got Dibrugarh its richly deserved title of the Tea city of India. Other than being the gateway to the neighboring Arunachal Pradesh, this cheerful and pleasant place is a treat in itself. The original tea city of Assam is blessed with lush greenery and rich flora and fauna. It rests on the banks of the Brahmaputra River. 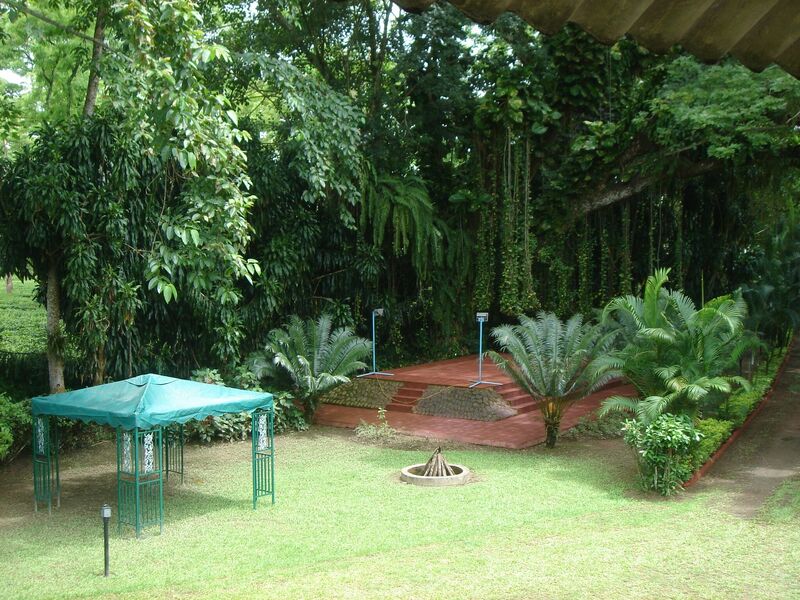 Nestled amid this natural beauty is the Estate Bungalow at Jalan Nagar. If a holiday in the property’s serene setting is not a dream holiday, then what is? The Estate Bungalow at Jalan Nagar is located on the outer edge of Dibrugarh, away from the hustle and bustle of the city. The bungalow and the tea garden have a timeless appeal, which is visibly explicit from the prominent architectural features of the property. One of the unique characteristics of the bungalow is the lack of iron nails anywhere in the flooring. The nails used on the floor are made of wood and are believed to have been handcrafted by Chinese artisans. The bungalows are called Chang Bungalows owing to their traditional construction on stilts or “Changs”. Its architecture spells perfection with its colonial charm and traditional design. Accommodation at the Estate Bungalow at Jalan Nagar is divided into six room types namely Siang, Dihang, Padma, Yamuna, Lohit, and Manas. Siang is an air conditioned suite with a king size bed. Dihang features a king size bed in an AC deluxe room. The Padma and Yamuna rooms are standard AC rooms with twin beds. Lohit and Manas are non-air conditioned, single rooms. Each of these rooms has an attached bathroom and is well-furnished with modern comforts including Wi-Fi, in-room services, and housekeeping. Every room in the bungalow offers magnificent views of the surrounding tea gardens. The greenery all around is a treat to the eyes and a balm to the soul. When the wonderful North East calls you with its wonders and hidden treasures, can any ardent traveler say no to it? We didn’t think so! All guest's are requested to carry valid Photo Identity card which has a valid address for verification purpose. The photo Identity card could be Driving License, Voter ID card, Valid Passport etc. The guest's will have show their Identity card on arrival at the front desk. This is mandatory requirement by Ministry of Home Affairs, Government of Assam. The natural beauty of Dibrugarh calls for its visitors’ attention. To explore the lush richness of the region, head to the Jokai Reserve Forest located only a little distance away from the property. You can admire the colorful flora and expect to encounter the striving fauna endemic to the forests of the North Eastern region of India. Birdwatchers on a holiday at the estate are in for a visual treat. Keep a lookout for small niltava, a flock of pompadour green pigeons, little pied flycatcher, and many other winged wonders when you visit the reserve. If you are up for some adventure, you can take a boat cruise on the Brahmaputra River. You never know you might get a glimpse of the migratory birds and the elusive Gangetic river dolphin. You can also visit a local weaving center to see how Assam’s traditional silk sarees with stunning designs and motifs are woven. Those who wouldn’t mind walking around can go for a walk in the nearby tea estates or even choose a package that includes tea tour and tasting. When you have done it all, sit back in a cozy corner at the property. What can be better than soaking yourself in the magnificent views of the rolling green carpet of tea gardens all around you? The closest airport is the Dibrugarh Airport (17 km). Flights from Delhi, Mumbai and Kolkata service the city’s domestic airport. Guwahati Airport is the next closest option (481 km). Dibrugarh Railway Station (6km) is the closest station from the property. Tinsukia Junction (50 km) and Guwahati Railway Station (464 km) are other options for railroad travelers. Do you know that the longest train service in India, Vivek Express, connects Dibrugarh and Kanyakumari? Tinsukia (50 km) and Jorhat (135 km) are some of the neighbouring towns from the property. You can enjoy a picture-perfect drive to Dibrugarh from Itanagar (201 km), Guwahati (462 km), Shillong (521 km), and Imphal (475 km), and many other cities.